I love me some bagels. I grew up in New York where I acquired a taste for warm, chewy bagels. 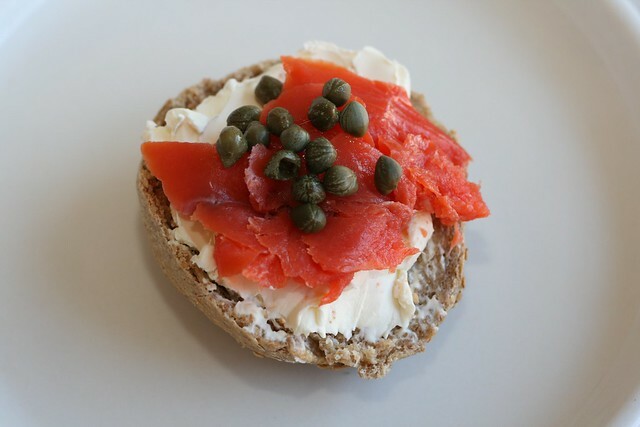 Especially when they are loaded with cream cheese and topped with lox and capers. That said, I really don't like the bagels you can buy in the store. Most bagels are made with white flour and commercial yeast. I'll be blunt: they make me gassy. And they are not nutritious. Sometimes I will buy the sprouted bagels you can find at Trader Joe's or Whole Foods. They're not bad and they are healthy. But they're just not very fresh. Even when toasted, they taste dry and crumbly. It's not their fault. Bagels should be fresh, eaten the same day they are baked. The solution? Make my own bagels. I was always afraid to try because I thought it would be hard. When I finally attempted it, I was surprised at how easy it is to make delicious whole wheat sourdough bagels at home. 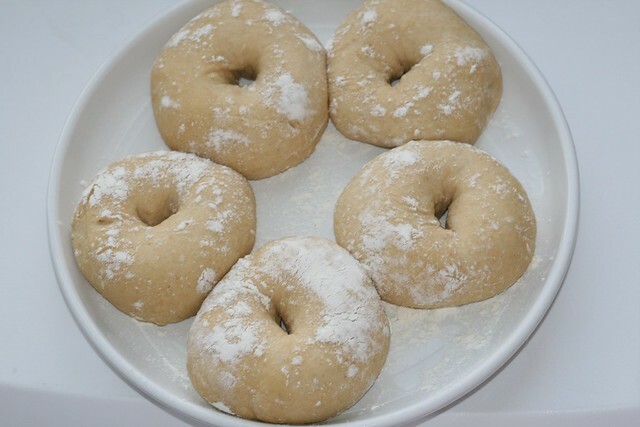 I teach this recipe for Whole Wheat Sourdough Bagels in my online cooking class, Healthy Whole Grains. This recipe is adapted from a recipe in Classic Sourdoughs, Revised: A Home Baker's Handbook by Ed and Jean Wood. Bagels require a lot of gluten in order to rise. For this reason, I suggest using half all-purpose unbleached white flour. If you don't want to use white flour, you can also use vital wheat gluten. You want to use around 1 TBS wheat gluten per cup of whole wheat flour. If you are using half white flour, you don't need to use any vital wheat gluten. Also: your sourdough starter should be very active. It should look like a doughy version of Champagne. Please see my post on Sourdough Bread to learn how to activate a sourdough starter. If you like, you can shape the bagels the day or night before and let them sit in the fridge overnight and make your bagels in the morning for breakfast. You can also freeze the dough rings for up to three weeks. Just thaw overnight in the refrigerator. Whether you refrigerate or freeze, make sure you bring the dough up to room temperature before you boil the bagels. Boiling gelatinizes the starch in the outer layer of the dough, giving the bagels their chewy crust. I added 2 TBS of sugar to the water to sweeten it which adds to the bagels' flavor. Overproofing can ruin your sourdough bagels. In the photo above, the bagels on the left were overproofed (they were also shaped too small). My kitchen is very warm: 75-80 degrees, without running the heater! (We're on the 4th floor.) I realized that my warm kitchen was causing my bagels to overproof. They looked and felt like rocks. The next time I made bagels, I moved the bowl of dough to our guest room and set it on a chair next to an open window. I bought an indoor thermometer to make sure the temperature stayed around 70 degrees F (it fluctuated between 68-72). I used the exact same recipe but this time the bagels came out perfect. 1. Place the active sourdough starter in a mixing bowl. 2. With a wooden spoon or dough whisk, stir in the eggs, oil, milk, sea salt, and 2 TBS of the sugar. 3. Add the flour one cup at a time. If you are using freshly ground flour, you may choose to sift a little of the bran out for lighter baked goods (I usually sift some but not all of it out). 4. When most of the flour is incorporated, transfer the dough to a floured board or counter top. Knead with floured hands for 5-10 minutes, adding more flour to keep it from sticking. 5. Transfer the ball of dough to a large bowl covered with plastic wrap. Lit sit (proof) for 8-12 hours at 70 degrees F (21 C). The dough should double in size. Be careful not to proof too long and if your house is too hot, make sure you cool it down to around 70 degrees (see information about overproofing above). 6. After the dough has risen, divide it into 10 equal pieces (you can weigh them on a digital scale). 7. Form the pieces of dough into balls. 8. Cover the balls of dough with a damp cloth and allow them to rest for 5-10 minutes. 9. While the dough is resting, bring 3 to 4 quarts of filtered water to boil in a large Dutch oven or other pot. Add 2 TBS of coconut sugar or sucanat. 10. Preheat the oven to 500 degrees F (260 degrees C). 11. Grease two baking sheets or line them with Silpat Baking Mats. 12. Press one of the dough balls with the palm of your hand. Find the center and push a finger through to make a hole. 13. Swing the dough around your finger to widen the hole. The dough circle should be around 1-inch thick and the hole around 2 inches wide. Don't worry if the hole seems too large: it will close up as the bagel boils and bakes. After each bagel is shaped, put it back underneath the moist towel. 14. Drop two or three of the bagels into the boiling water. Don't overcrowd the bagels, otherwise the water will get too cool. 15. Boil the bagels for 1 to 2 minutes — until they have expanded in size. 16. Turn them with a slotted spoon or spatula. Let them boil for another 1 to 2 minutes. 17. Remove each bagel from the boiling water. The bagels will have puffed up and the centers will be almost closed. 18. At this point you can add poppy seeds, sesame seeds, or whatever toppings you like. Put the seeds on plates and then dip the the tops and sides of the bagels into the seeds. 19. 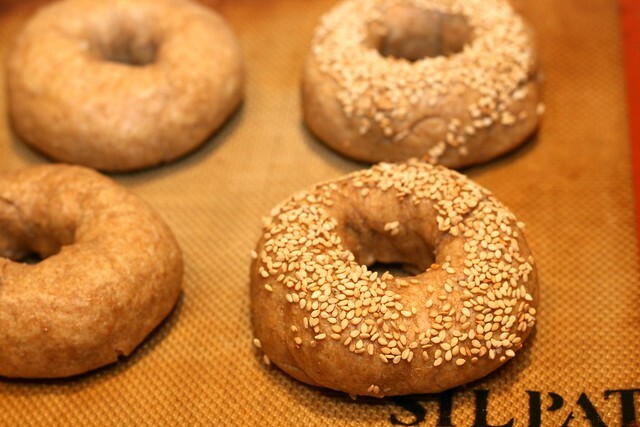 Arrange the seeded bagels on the greased baking sheets or Silpats. 20. Bake the bagels in preheated oven for 10 minutes. After 10 minutes, check the bagels and loosen them from the baking sheet with a spatula (most likely they won't sick but check just in case). Then bake for 5 more minutes for a total of 15 minutes. 21. Transfer them on a rack to cool. These look fabulous! Question: do you use sprouted flour for these? You should open a bakery! =) looks delicious! OMG I was just thinking about trying to make homemade healthy bagels just yesterday!!!!! I finally tossed the storebought ones cause I know they are junk—awful morning sickness all day and all i can stomach was bagels and pizza!!! Since I am feeling better, I’ll take this as a sign and get to it;D I love baking homemade sourdough sprouted spelt bread for my family….I will definitely try your recipe. thanx! I am about 4+ weeks into experimenting/baking with whole wheat sourdough. I always have sourdough starter on the counter these days. So far, I have made sourdough bread, boulles, and pancakes. I love bagels! Thank you so much for posting this recipe. I cannot wait to try it! oh my, its going to be really hard to stay on the gaps diet with recipes like this one floating around in my head! I want to make them for my family, but I know I would buckle under the pressure and eat one! I will put this one on the back burner for when my digestive system is in better shape! Elaine, where did you learn how to make sourdough sprouted spelt bread? That sounds heavenly to me!!! Is there a book?? And I just bought Organic hand crafted Cream Cheese. I buy Whole wheat pastry flour. Will that work for these Bagels? That said , has anyone heard that, Whole wheat robs your bones of Calcium? I have osteoporosis, and I have been hearing about that!!! Although sesame seeds are a good source of Calcium..
Sure whole wheat pastry flour should work. Whole wheat does rob your bones of calcium IF it is not properly sprouted soaked or fermented (like sourdough). Just made these for breakfast and they turned out really well for a preliminary experiment. Thanks for the recipe! I adore sesame seed bagels! I want to try these. Do you think the sesame seeds should be soaked and dried first? Or are there not enough to make a difference? So I am making these currently! So I don’t know how they have turned out yet -I am boiling the water! Yay! But my dough is insanely wet-even after adding another cup or so of flour! Did I do something wrong? Is it the altitude or maybe my starter? Is the dough supposed to be suuuuuper sticky? Haha! 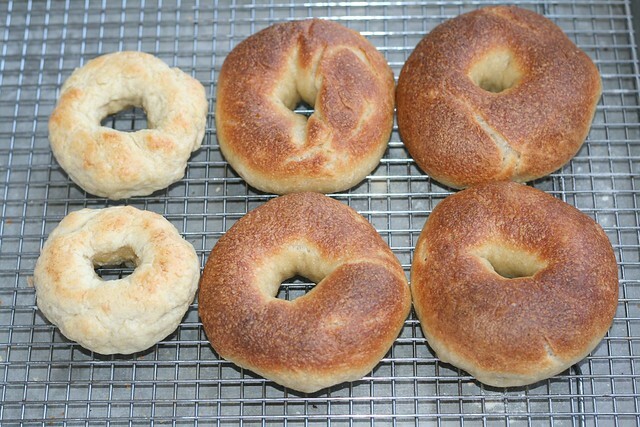 I am making these now…but my first two bagels totally fell apart in the boiling process! Any ideas why, and how to fix it so I don’t ruin the rest? Not sure — I’d need more info. So I’ve made these twice now and while the taste is pretty good, I can’t get mine to rise much (nothing like what yours look like) and the only part of mine that get any color is the part that is in contact with the baking sheet. Any ideas what I’m doing wrong? Thank you for the recipe! Most likely they are overproofed if they are not rising. This could be because your kitchen is too warm? Proof them for less time. Thanks for the yummy recipe! My daughter is so happy! Aww that is awesome!!!!! What a happy little girl! I will post your blog post on Facebook. Wondering why you didn’t use sprouted flour with regular unbleached flour? I made spaghetti last night with sprouted flour and it didn’t have as much body as store bought pasta. Does it matter what kind of sprouted wheat you use? Hard White Wheat is good for breads, Soft wheat is good for cakes and cookies, but what about pasta? You could use sprouted flour. I make pasta with 100% sprouted whole wheat flour and it comes out great. I typically use hard red wheat.